As we loaded up the car to head out, my husband asked me "Which farm do you want to go to? And are they open today? At what time?" I answered, "I guess the same one we went to last time. I didn't check to see if they are open. It's June. They usually open every day in June. If they aren't open, I am sure there is a different farm that is." Clearly, I did no planning for this trip. It was a beautiful (but hot) morning in the Leona Valley, where there are more cherry farms than you can shake a stick at. 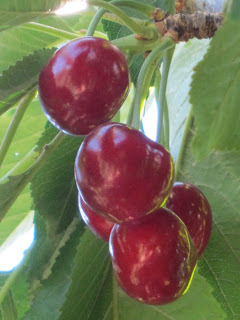 When we got to the farm, the farmer informed us that it was the last two days that the farm would be open, and that there are still plenty of cherries, but we would have to search for them. The bonus, of course, is that everything left is completely ripe. Heh. Good thing we didn't wait until next week! I guess my lack of planning panned out (this time). Between my three kids, one extra friend, and my husband and I, I think we ended up with more than 20 pounds of cherries. I'm sort of glad we had to search for them. Imagine how many they would have picked if every branch had been loaded down, like it was last year! My daughter and her friend went off on their own, reading the chart at the farm, locating the different types of cherry trees, and harvesting specific varieties. They climbed high up into the branches to pick their cherries, and filled their buckets up to overflowing. My youngest son proclaimed himself to be in charge of the lowest branches. He walked around half-stooped, winding in and out of trunks to find the cherries that had been missed due to being directly underneath leaves and out of the line of sight of anyone over 4 feet tall. My middle son went for volume. He filled a couple of buckets by looking for the trees that had the most cherries, and then getting to work all in one place. 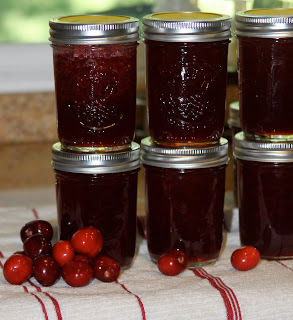 "Cherry pie... Cherry cobbler... cherry cheesecake... cherry jam... cherry vanilla shakes... cherry chocolate cake... cherry salsa..."
First up was some cherry jam. I am reading a book right now, "Animal, Vegetable, Miracle" by Barbara Kingsolver. I am planning to do a little review/recap when I finish reading it. For now, though, let me say that it is about the importance -- as well as the benefits and the obstacles -- of eating locally produced food. I was very excited to buy some local fruit, get it off the tree and made into jam all on the same day. It doesn't get much fresher than that! Prepare the cherries. Combine the cherries and lemon juice, and slowly stir in the pectin. Place it on the stove, and bring to a full boil. Add the sugar, all at once, and stir to combine. Bring it back to a full boil, and cook for one more minute, stirring constantly. Remove from heat. Scrape the foam off the top. Ladle into hot jars (The jars need to be hot so that the glass doesn't crack when the hot jam is poured in.) Fill each jar to 1/4 inch from the top. Wipe the edges of the jar clean. Place a lid on each jar, and screw on the band until it is finger-tip tight. Place the jars into a large pot of water, and boil for 10 minutes. (for higher elevations, check this chart for processing times). The water level needs to be 1-2 inches above the top of the jars. After 10 minutes, remove from the water using a jar lifter (or tongs). Let them sit, undisturbed for 12-24 hours. You will know if they are properly sealed if you press on the lid and it doesn't give at all. 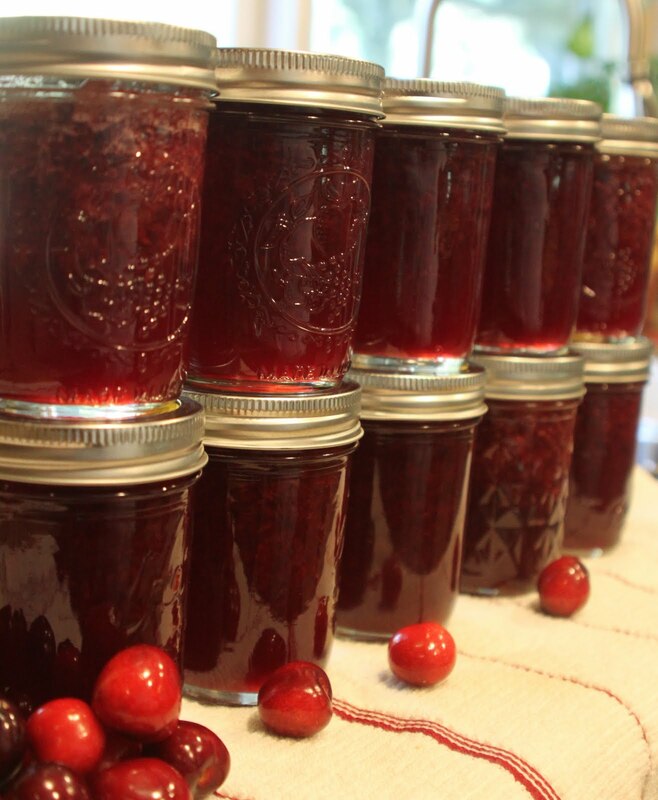 This recipe makes 7 half-pint jars, plus a little extra for enjoying right away.